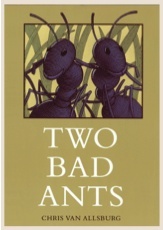 In this activity, appropriate for 1st-3rd graders, students participate in a discussion of a shared reading of the illustrated book “Two Bad Ants.” Students then create a T-chart comparing the perspectives offered of ants and humans in this piece. Materials and resources: Copy of “Two Bad Ants” by Chris Van Allsburg. The book’s web site http://snipurl.com/2badants gives a plot synopsis and suggestions for key comprehension questions. Students will need a copy of a blank t-chart (see http://snipurl.com/tchart ) to chart the ants and human point of view and writing tools. Do a read aloud of the book, asking engaging questions and calling for predictions from students. Draw students’ attention to the pictured perspective of the ants in the story, comparing the descriptions of what the ants experienced to what the humans in the story experience. Model for students how to begin a t-chart, which compares these two different points of view of the ants and humans. Students work individually or in pairs to complete the comparison t-chart. of view of the ants and then the humans. There is a basketball laying on the ground underneath the hoop and no one appears to be playing with it. Lee is talking with friends nearby and Tom comes over to the ball and starts to take some shots. He then starts to dribble away from the hoop. Lee runs over and yells at Tom to put the ball down. “Back off! I’m just playing with it. I didn’t know it was yours, I wouldn’t steal this piece of crap,” Tom yells back. Both boys face off, angrily and continue to name call back and forth. * Students work individually or in partners to complete a t-chart as was completed for “Two Bad Ants,” this time describing the point of view of Tom and Lee in regards to the basketball. * Discuss what happened because Tom and Lee had different points of view about the basketball. * Ask students to discuss the connection between these two sets of comparison charts. Consider the world appearing to be entirely different to the ants and humans and Tom and Lee. occurs, you can be sure that there are at least two different points of view in play. Conflict resolution invites all points of view to be discussed and valued. Bonus Discussion: What is a possible peaceful solution to this scenario?